Sources cite a number of names for prospective Swoosh team riders, the biggest of which is Olympic medalist and Winter X-Games favorite Danny Kass, who jumped ship from long-time sponsor Vans. 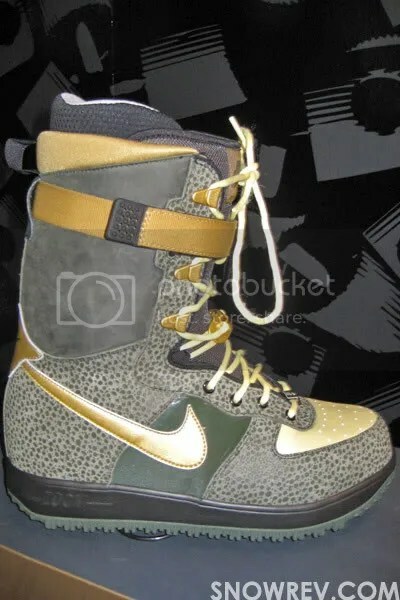 Danny’s a smart guy (having launched/owned the park-rat fave Grenade Gloves), and the cutting edge nature (read: sometimes ugly) of Nike design falls right in line with the outrageous aesthetic of his Grenade line. Also, they also probably made the check out to Danny Ka$$, Danny SO MUCH CASH, D-Money Kass or some other equally moronic nickname implying the transfer of large sums of money. Given Nike’s meteoric success with Nike Skateboarding (SB) and 6.0, it’s only natural to assume that they’ve already got a bit of a built-in following in the action sports demographic. 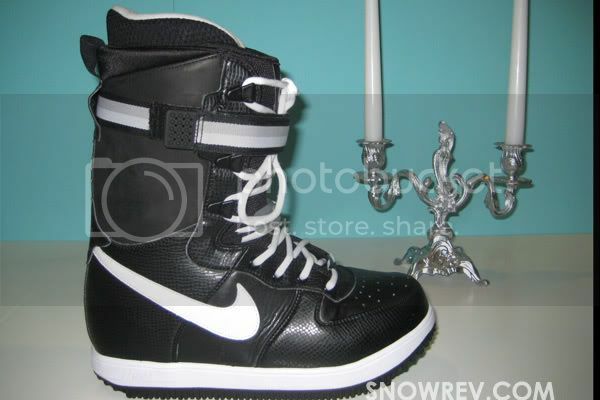 Boots are a natural first for Nike, as they are first and foremost a world-renowned footwear company. Outerwear will probably follow soon after, as they undoubtedly already have the material and R&D resources necessary to produce technical shells and pants. The biggest hurdle will be if they decide to tackle the hardgoods industry. Modern boards and bindings are highly technical, with each hardgood company pushing the limits every year and making boards that are lighter and faster, bindings that are more tweakable and stable. While I doubt that Nike will start from scratch here (who can say no to Nike money? ), they will probably be met with a good amount of resistance from the leaders in this industry. Burton (who Nike had repeatedly tried to acquire in past years) is probably shaking in their, uhm, boots. Far and away the largest and most popular brand in snow, Burton will no doubt fight tooth and nail to fight off a company that has deeper pockets, more resources, and an all-or-nothing philosophy. Burton stands to lose a whole helluva lot if Nike can carve a niche into territory that Burton owns (through Nike-like monopoly, of course!). 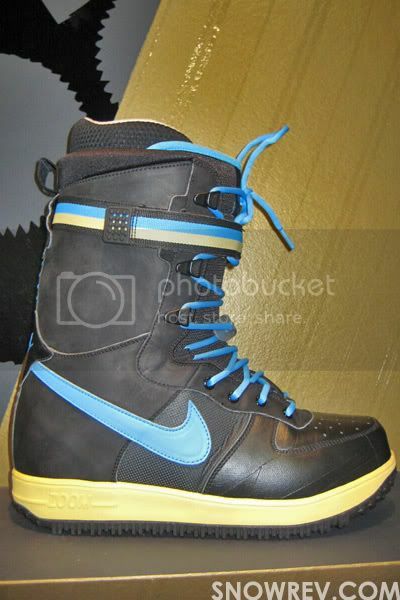 What Nike doesn’t have, however, are riders, a fanbase and the brand loyalty that Burton commands. It’ll be interesting to see these two take each other on. 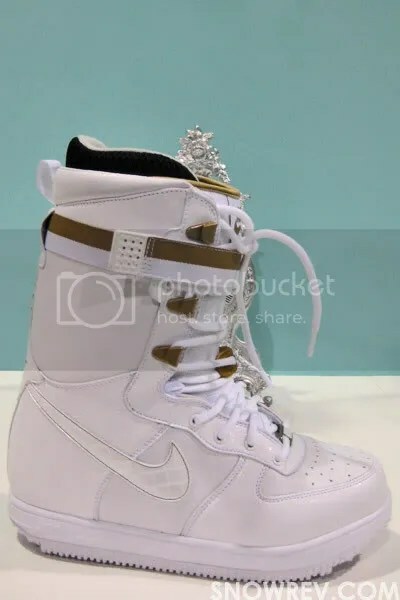 I personally can’t wait until they release the inevitable Limited Artist Collab Grenade x Nike x Supreme / (cos x) ^ lim ->0 Stormtrooper Dunk Boots that I’ll have to wait in line for at Bear Mountain. Yum. A traditional lacing system, simple support strap, and retro look means that this will more than likely be an entry-level boot. 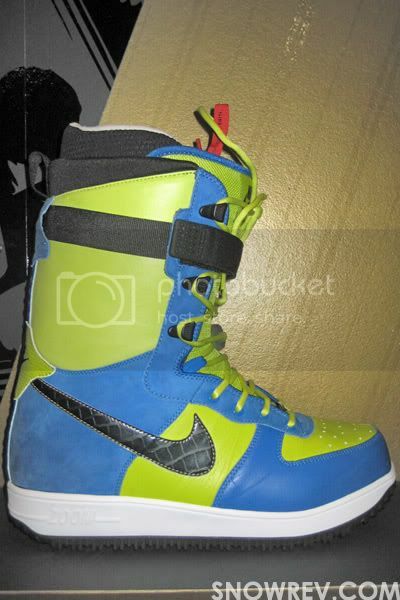 I’m stoked to see what kinds of tech Nike can come up with to compete with ultra high-end stompers like Burton SLs. This boot, and the two below, are women’s boots. In a male-dominated sport, what will Nike do to tap sales from this demographic? 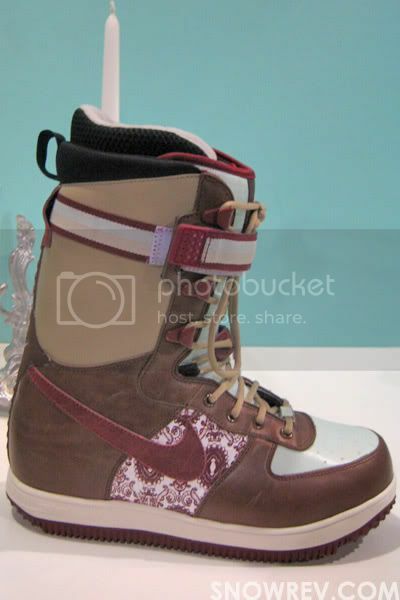 This entry was written by alexanderworthington and posted on September 26, 2008 at 12:39 pm and filed under News with tags Burton, Danny Kass, Nike, snow, snowboarding, snowboards, SO MUCH MONEY. Bookmark the permalink. Follow any comments here with the RSS feed for this post. Post a comment or leave a trackback: Trackback URL.